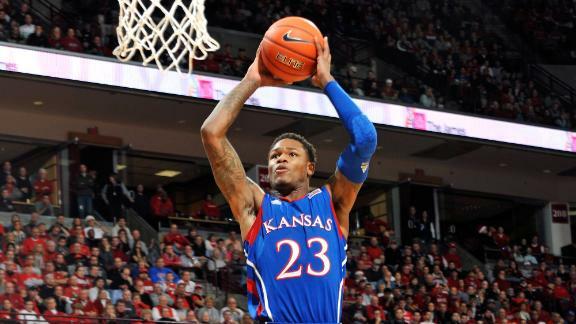 If it was unknown before, I’ll say it now- I am a big fan of the Kansas freshman sensation Ben McLemore. I believe he is a player with special talents that no other freshman in the NCAA has. A couple of weeks ago, I wrote an article on Ben being “The Freshman B.M.O.C.”. I admire McLemore for what he has accomplished this season. Despite only playing in eleven games, Ben has been raising eyebrows across the country with his play, especially after a big win at Ohio State. As I was doing my daily routine of reading blogs about the Kansas guard, one caught my eye. It was an article from rockchalktalk.com comparing Ben McLemore to Miami Heat star Dwayne Wade. Right now, one is an NBA All Star and the other is a redshirt freshman in college. However, as freshmen, their stats nearly mirror one another’s. Ben could very well be a player like Dwayne Wade was at Marquette, and here is why. I compared McLemore and Wade in points per game, rebounds per game, assists per game, their floor percentage, and three point field goal percentage. In 32 games played as a freshman, Dwayne Wade scored 17.8 points per game. Through 11 games, McLemore is averaging 16.5 points per game. In rebounds, Wade edges out McLemore with 6.6 boards compared to Ben’s 5.7. Dwayne is also beating Ben in assists with 3.4 compared to 2.3. Ben has a barely better field goal percentage with 48.8 and Wade with 48.7. However, Ben’s three point percentage is much better than Dwayne Wade’s. McLemore has hit 40.8 percent of his threes this year, but Wade only knocked down 34.6 percent. Currently, Ben’s floor percentage is 54.1. Wade’s was 54.4 as a freshman. Floor percentage is the chances of a team scoring when the ball is in a certain player’s hands. It is a very important stat that often goes unnoticed. In other stats, Ben McLemore is much better right now than Dwayne Wade was. McLemore shoots 85 percent at the free throw line, but Wade only shot 69 percent. Overall, Ben’s offensive rating is 119.1. Wade’s was 108.3. If none of these numbers make sense, here is a graph comparing the two. The blog I read acknowledged the odds of Ben McLemore becoming the next Dwayne Wade— a two-time NBA Championship winner, Gold Medal winner, etc. Those are some big accomplishments that McLemore is being called “destined to be”. The odds of any player having this sort of status are slim to none. But would it be unfair to say McLemore has better chances than others? His stats would say differently. This entry was posted in Basketball, Basketball, Home, Midwest, National and tagged Ben McLemore, Bill Self, Dwayne Wade, Kansas Basketball, NCAAB.